African Water Log: Christmas Greetings from Tanzania! Christmas greetings from warm and sunny Arusha, Tanzania! After completing our service in the Central African Republic (CAR) in 2013, we received a new call as ELCA’s East Africa Regional Representatives, based in Arusha. While both Tanzania and CAR are in Africa, there are some differences: Tanzania has a population of 49 million, while CAR has only 4 million. The Evangelical Lutheran Church of Tanzania has over 6 million members, bigger than the ELCA! It’s wonderful to see how God is working in Tanzania. The ELCT is one of the fastest growing Lutheran churches in the world! Our job as ELCA East Africa Regional Representatives involves developing relationships with both the Tanzanian and Kenyan Evangelical Lutheran Churches, relationships with their companion ELCA synods, representing the ELCA at regional meetings and events, and supporting our ELCA missionaries and volunteers in whatever ways we can. 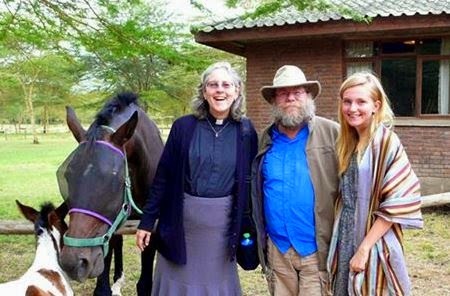 There are currently 25 ELCA personnel serving in East Africa: 14 full-time missionaries and 11 volunteers. That’s not including the nine missionary kids living here in East Africa, ranging in age from 2 to 21! Our daughter Christa (age 18) is one of these. She is completing her senior year of high school at Rainforest International School in Yaoundé, Cameroon. Next year she hopes to join us here in Tanzania for a “gap year” before heading off to the U.S. for university. Thank you for your prayers and support. They mean a lot to us. We wish you a Merry Christmas, a Happy New Year, and many blessings in 2015! For a peaceful election year in Tanzania: 2015 will see a Constitutional Referendum in April and Presidential and Parliamentary elections in October. For an end to violence and terrorist attacks in Kenya so that our missionaries and church partners there may do their work in safety and all may live in peace. For peaceful relations between Christians and Muslims in East Africa and throughout the world. For safe travels during Christmas/New Year’s vacation for our daughter Christa and for many of our ELCA colleagues who are traveling. Praise and thanks for God’s blessings in 2014!